They like long walks, chasing squirrels, tubes and riding in the truck. They are a constant source of joy and amusement. I love this photo. 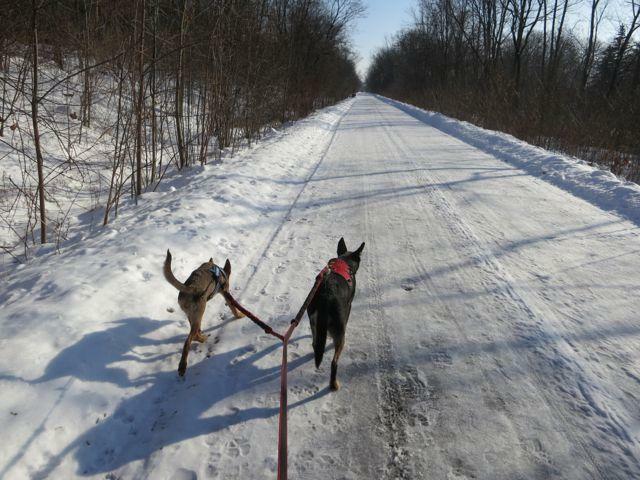 Two dogs pulling, looking down a long road,....it looks like Heaven to me. I like that one too. Cake was just 6 months at this point. Kona is about the right size now for a dual lead. They both pull so much though I'm not sure that this will work for them. Once some of the snow melts around here we'll give it a shot. Been rather brutal weather wise lately. They both pull so much though I'm not sure that this will work for them. Give them something to pull. Ah HA! That is why Waki looks bigger than her! That IS a long road ahead of them. What are they pulling? They weren't pulling anything. We were just working with the lead on a local rail road line turned bike trail. I got the call for Waki 3 years ago on Valentines day so I am enjoying this tribute to his anniversary which was the start of our walking on this road together (and adding a Cake). Why does that suddenly make my wait seem so long? View it as more time vs more waiting. Wow...it has been 3 years already...Sherab & I both got the call within days of one another since Waki & Lili are siblings! Funny how time flies isn't it? I remember when Lili arrived I was so over protective and hovering & all that....now with Kona my attitude is more like, "...What? Really? Ha! No...she'll be fine, let her be...& tell Lili to stop tricking her"
...& tell Lili to stop tricking her"
C, she was 5 lbs at 12 weeks -I can understand why you were so protective. One of my all time favorite pix is the one with Lili and the flip flop. Kona is more robust. Waki is loving the snow and cold. He's like a seal swimming in the snow. Summersalts, Pepe- le- Pew bounding (it's up to his chest and neck). Are your two loving it or are they more tropical? Kona is immune to feelings...any feelings. She lives to be outside. When we were hovering around at single digits a few days ago (& as they're predicting for the weekend) she'll curtail her outside time but only if requested or her little feetsies get cold! Lili is a little less ambitious about the outside in winter than Kona is...when it's really cold she's out, bidness done, then right back in. Kona actually does have feelings...and you can hurt them by saying the word no. No is apparently poison to her. For example, we were sitting on the couch last night watching something stupid on TV & she wanted to jump over me into the back part of the wrecked room which is usually off limits for her as it's a great big temptation of storage items & bookcases & other things of great interest to a lunk-head puppy. I'd positioned myself on the end of the couch that would provide access to the rest of the room (a folding card table at the end of the couch has served a blocking function of the path for that purpose). She'd jumped over the couch several times in an effort to explore and had been reprimanded for each effort but yet continued to challenge the policy by jumping over. So, I placed myself on that end of the couch to thwart those efforts. Her response was to come to me on the couch, sit down, place a paw on my arm and softly mumble. My response was to say, 'I know what you want...no.' She responded with a bark that sounded like it was amplified through the public address system of the United Center where the Chicago Bulls & Chicago Blackhawks play....mere inches from my face even! I stood my ground and didn't budge. She jumped down, turned around, jumped back up and repeated the process five or six times. Each time I responded with less words and more 'no' body language and her agitation became even greater. Finally, she gave up and walked to the other side of the room and crumpled onto the floor to brood & after a few minutes she drifted off to sleep. Lili came up with the tennis ball (did I mention that she's insane?) dropped it at my feet & she and I started playing ball. At one point the ball got trapped into an area that Lili wasn't comfortable retrieving from so I got up to retrieve the ball for her. That was Kona's opportunity. In eleven microseconds she was awake & over the couch in a flash. By the time I'd turned around from picking up the ball she'd made herself comfortable in an old crusty towel that we use to clean them up after coming in from wet muddy backyard adventures & had one of my son's shoes in her mouth! I looked at her from across the room (about 30 feet I guess) and said only 'NO!'. She reluctantly got up, dropped the shoe, walked slowly, as if to her own execution, back to the couch, jumped back over to the other side & sat at my feet with a look of defeat on her face.....until I took my eyes off her and she jumped the couch again!! Edited by Chinatola, 12 February 2015 - 07:00 AM. Lili came up with the tennis ball (did I mention that she's insane?) dropped it at my feet & she and I started playing ball. At one point the ball got trapped into an area that Lili wasn't comfortable retrieving from so I got up to retrieve the ball for her. That was Kona's opportunity. In eleven microseconds she was awake & over the couch in a flash. These canines are masters of the "Cahoots Conspiracy." Oh what a great story China, I was truly laughing out loud. Good to know that our strong willed and wily one is in good company! Hahahahaha! That is so very funny. I think -- in many ways -- these creatures we've chosen to share our lives with are NOT just testing us to win -- they are testing us to develop understanding, relationship and integration. "OK, boss, what about this situation?" "OK, got it. You want this behavior in this situation." "OK, you really, really mean it." Once that learning occurs, these darn thinking dogs can frequently apply lessons learned to new situations. Oh, sure, it's frustrating & exhausting to go through, but the end result is, at minimum, worth it. I think you're right Gib. I had a conversation with a business associate at a dinner meeting this week and the topic of dogs came up. He is a dog guy just like us and I wasn't aware of this facet of his personality as we've only ever had a business relationship until the last few years. He lost his wife four years ago to cancer and we'd started to develop a closer bond over the ensuing four years so that led to a more personal relationship sprouting out. When the dog subject came up & my passion for this breed came overflowing out in my words he became visibly more engaged in the conversation with questions and comments. It was pretty cool. When the question, "Are they trainable" came up...it was on! I mentioned that our experience with Lili was almost like an observational policy by the dog to determine what is acceptable and what was not acceptable to me & our household. I haven't really trained Lili...she's sort of trained herself by behaving in a manner that was likely to get a positive reaction out of us. Of course there have been moments but by and large she was a breeze and still is! She most certainly spoiled the heck out of me with respect to training! Kona has taken that up a notch and is a little more testing of that theory than Lili is but she's still very respondent to body language cues and no verbal interaction which is an amazing aspect of these animals that I've seen repeated in countless stories on these boards over the three short years that I've been a regular visitor here. It's truly astounding the ways in which these dogs connect ...oftentimes without our full realization of the depth of that connection. They continue to amaze. Frustration & annoyance be damned! (actually, I couldn't stop laughing at her during this couch episode...she on the other hand was not amused). PS. I also think that my buddy might become an AID parent soon too! HE WAS SMITTEN & HE HASN'T EVEN MET 'EM YET! Edited by Chinatola, 13 February 2015 - 01:50 PM. These dogs are so beautiful and powerful! I love this picture!